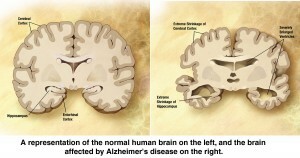 Alzheimer’s is a particular disease that affects the brain and brain function. Memory loss, difficulty with speech, disorientation, impaired judgement, and withdrawal are just some of the common symptoms of Alzheimer’s. Dementia, on the other hand, is a loss of cognitive functioning regardless of cause. There are more than 100 different diseases and conditions that can lead to dementia. Dementia is a general term that characterizes a group of cognitive symptoms; Alzheimer’s disease is just one cause of dementia. Find effective alternative therapies for dementia including Alzheimer’s disease. 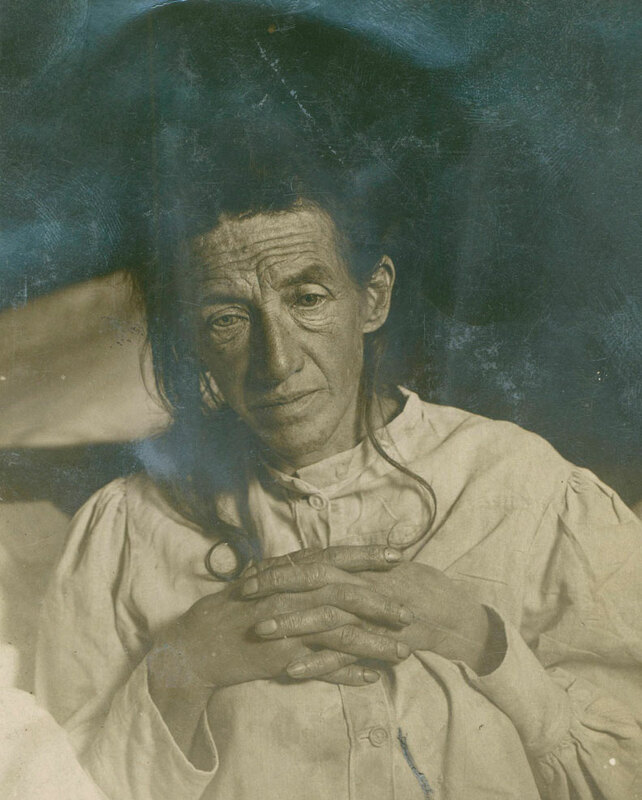 Auguste Deter – taken in 1906 shortly before her death, during her stay at Frankfurt’s City Mental Institution. 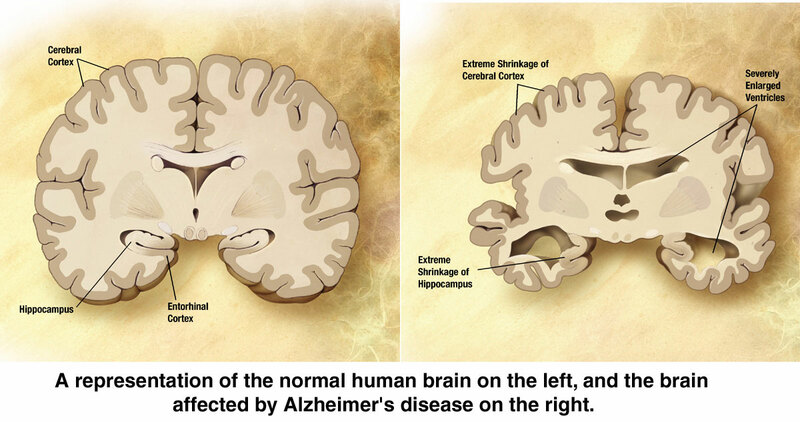 The brain disease that has come to be known as Alzheimer’s disease was first described in November of 1901. The chain of events began when Karl Deter brought his wife, Auguste, to the Städtische Heilanstalt für Irre und Epileptische (City Hospital for the Mentally Ill and Epileptics) in Frankfurt, Germany. Auguste’s behavior made it almost impossible for Karl to work anymore. She would sometimes wake up in the night and scream for hours. Knowing what we know now of Alzheimer’s disease, she undoubtedly needed a lot of personal care. Upon her admission, she was interviewed by a resident at the hospital, a young doctor named Aloysius Alzheimer. He had joined the staff at the hospital thirteen years earlier and was pursuing his interests in psychiatry and neuropathology. Auguste Deter had problems with memory and with reading and writing, and she showed signs of disorientation. She was diagnosed with presenile dementia. She sits on the bed with a helpless expression. What is your name? Auguste. What is your husband’s name? Auguste. Your husband? Ah, my husband. She looks as if she didn’t understand the question. Are you married? To Auguste. Mrs D? Yes, yes, Auguste D. How long have you been here? She seems to be trying to remember. Three weeks. What is this? I show her a pencil. A pen. A purse, key, diary and cigar are identified correctly. At lunch she eats cauliflower and pork. Asked what she is eating she answers spinach. When she was chewing meat and asked what she was doing, she answered potatoes and horseradish. When objects are shown to her, she does not remember after a short time which objects have been shown. in between she always speaks about twins. When she is asked to write, she holds the book in such a way that one has the impression that she has a loss in the right visual field. Asked to write Auguste D., she tries to write Mrs and forgets the rest. It is necessary to repeat every word. Amnestic writing disorder. In the evening her spontaneous speech is full of paraphasic derailments and perseverations. 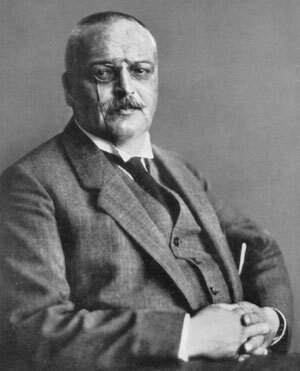 Later in 1906, Alois Alzheimer presented the results of the autopsy of Frau Deter’s brain to the South-West German Society of Alienists. In his speech he described two abnormalities or the patient’s brain, neurofibrillary tangles and amyloid plaques, the plaques and tangles that have become synonymous with Alzheimer’s disease. The tangles are insoluble aggregates of tau protein. Plaques (known as senile plaques) are deposits of another protein, amyloids. It is still not completely clear what role these two proteins play in the development and progression of Alzheimer’s disease; it is commonly agreed that there is an association, since these plaques and tangles are present in all cases of the condition. Temporal lobe – speech, memory, hearing. Parietal lobe – sensory integration, spatial sense, navigation. Frontal cortex – involved with, among other things, problem solving, memory, language, judgment, is thought to be the center for our personality. Damage to areas in the frontal cortex often leads to personality changes. Hippocampus – short term memory, spatial navigation. Cingulate gyrus – emotion formation, memory, learning. The correlations between these brain functions and the common symptoms of Alzheimer’s disease are obvious. Read more about the Alzheimer’s brain. She eventually lost the ability as well as the incentive to care for herself. Her husband was forced to hospitalize her. In the next 4½ years hallucinations were added to this list, and the original symptoms grew more severe until she lost almost all cognitive ability. Recognizing the symptoms of Alzheimer’s is important, especially if you think you or someone you know may be at risk. Learn more about the symptoms of Alzheimer’s disease. The Alzheimer’s symptoms that people hear about most frequently and are most familiar with are memory loss and getting lost. The jokes about memory loss and aging, somewhat less popular now than they were a few years ago, have helped bring our attention to the problem of memory loss. Wandering, and becoming confused and lost, have become familiar symptoms because of the news stories and alerts that we hear all too often. Misplacing items – Often the patient hides important (to him) things, then forgets that he hid them. Language difficulties – He might have trouble finding the right words, particularly proper names and nouns, and will often use words that sound the same, or even make up words in place of the word lost from his repertoire. He may have trouble completing sentences, perhaps forgetting how the sentence started before he has a chance to finish it. Conversations become irrelevant – He will say things that seem totally unrelated to the conversation at hand, or provide answers that seem to have nothing to do with a question asked. He may become less willing to participate in conversations, perhaps aware of his difficulty, and wanting to avoid embarrassment. Simple tasks become difficult or impossible – Even things that he has been doing for years. Arithmetical and mathematical procedures can get especially confusing, making familiar activities, like reconciling the checkbook, not only difficult, but aggravating. Temporal confusion – He may lose awareness or conception of the time, the day, or even the season. He might wake up in the middle of the night, and call someone thinking it is the middle of the day. He might puton his winter coat to go out in the summer, or shorts on a frigid day in January. Sleep disorders – The brain controls the rhythms that influence our wake-sleep cycle. The neurological damage of Alzheimer’s disease can disrupt these rhythms resulting in sleep problems. Light Therapy is an effective treatment in many cases of Alzheimer’s related sleep disorders. Physical impairment – Muscular movement becomes slow and unsteady, balance is impaired, and walking becomes difficult. As these conditions worsen, safety can become an important issue. Complications from broken bones from falls and other accidents rank fairly high in actual cause-of-death in Alzheimer’s deaths. Agitation, depression, anger – These are very common behaviors in Alzheimer’s, and can at times be the most difficult to deal with. If she were alive today with the same symptoms, Auguste Deter would be diagnosed with early-onset Alzheimer’s disease. This form of the disease accounts for less than 10% of all cases of the disease. Whereas Alzheimer’s disease, almost by definition, is often first noticed at about the age of 65, early-onset or younger-onset AD of the non-Familial type strikes people in their 50’s or early 60’s. About half of all early-onset Alzheimer’s is Familial Alzheimer’s disease. Making up less than 5% of all Alzheimer’s is of the Familial Alzheimer’s type, it is distinguished from other forms of the disease because of a genetic factor. Familial AD often appears in much younger people, sometimes as early as the age of 16, and requires that at least two first-degree relatives (parent, sibling, or offspring) be diagnosed with AD. Because of its genetic connection, many researchers are concentrating on this particular form of the disease in their search for causes and cures. This avenue of investigation perhaps holds the most promise in the quest for a cure for this terrible disease. Everyone, every family, every situation involving Alzheimer’s disease is unique. The list of symptoms is by no means complete, and not everyone with Alzheimer’s will manifest all of the symptoms in the list. Everyone with the disease progresses through it at a different rate and in a different way. Also, if you recognize any of these symptoms in yourself do not assume that you are in the early stages of the disease. We all misplace things occasionally, forget names or what we had for dinner last night, or stumble over our own feet once in a while. Some of the symptoms, like forgetfulness, are normal conditions of the aging process. Normally, things forgotten are later remembered. Memories lost to Alzheimer’s disease are very often lost forever. As time and my own understanding progress, I think that we should be looking for a way to prevent Alzheimer’s disease rather than a way to cure it once it has been diagnosed. In the 100+ years since Dr. Alzheimer first described the disease, very little progress has been made toward this end, whether cure or prevention. On the other hand, our understanding of the brain has advanced markedly in the last few years. This gives me some hope that we will soon discover a way to prevent neurological diseases like Alzheimer’s. And read more about Alois Alzheimer and the discovery of the disease that was named after him in Dialogues in Clinical Neuroscience.